what is the difference between Precinct and block is it same? Where are precincts 21& onwards, abhi tak پہاڑی سلسلہ جاری ہے. In the entire map I unable to find PRECINCT-28 / PRECINCT-31 location is it after the hill or in your feature plan while we pay your all 6 installment until now. I think Bahria Town having a good reputation so should maintain it and those are paying all installments they should get his plots in between PRECINCT 1 to-20, at least PRECINCT-7 to 16 because we maintain our loyalty to paying instalment in time not an investor only book a plot and earn money our installment money run the BTK expenses. Do u have a map of 29C. Plz share. i have plot size 10 250 sqyd with regn no btkp-fty.3039 . i am waiting for plo no pls. Where are precinct 21 to 30? I think its near Nori-Abad now. This is old map taken from BTK Master Plan. New map is changed. Where is the precinct no 26??? Is this really true, then they will be very very far from the main highway. This is fraud, do you agree? yes i do agree. one of the biggest in its kind. I see less schools in Precincts 21-31. As compared to Precincts 1-20. Where would the Roots Millennium School be (36 Kanal Campus). Please let us know. Where is located in map precinct 21-32 ? or it is totally fake & why 6 installments paid customers are not the plot numbers in balloting it’s mean that in balloting Malik Sb favoured to his own dealers custody owned plots. It is totally disappointed to us from Malik sb & You should realize Malik sb that you are doing totally wrong my mean that first you favoured that customers who paid full 6 installments till balloting date than other customers. My point of notice that you shall date announce for 2nd stage balloting soon & build your own trust money is not important as trust. Gosht ki dukan pe qasai sabse achhey rookhay (raan waley) piece ko sabse front pe latka ke rakhta he jisko wo aakhir tak nahi bechta or gahik usi ko dekh dekh kr aatey rehte hen or wo qasai chheechray, haddiyan, charbi wala kachra gosht pehle bechta rehta he (ye piece bik gya to phr kon aega?) Yehi haal Bahria Town Karachi ka he jahan mojooda land, map, progress & work plan sirf DIKHANEY kelye last tk rakha jaega or logonko peechhey biyaban banjar sunsaan areas me (jab kabhi wo zameen khareed li jaegi) plots diye jaenge. sirf 7-8 hazar acer zameen abhi inke pas he or yelog 40 hazar acer zameen (only in papers) bech chuke hen. Un 21-30 number precincts ka filhaal koi physical wujood nahi, sirf documents ki lolly pops hen, bethey chooste rahye, kai saalon tak. or apni khoon paseeney ki kamai sari saving samet inke hawale karte rahye mehengi installments ki soorat me. Sab BTK ki business tricks hen AGENT MAFIA ke sath milkar. Artificial instability & price up n down, all are parts of this game to make pockets of customers empty and to fill out their bank accounts. where is precent 22 ?? PRCT 21-32 still not bought by BTK, so only pay the money they will buy the land, So keep calm and dua for all. It is very surprising to see the allocation of Precinct. We as overseas paying the higher amount 30% to 40% in foreign currency for Bahria Homes but you allotted us Precinct 11-B with mix-up of local block at last Corner of the project. I do not understand why Bahria Town is cheating with overseas Pakistani and not allocating property in so called “Overseas Block”. I request to Bahria town management review the allocation revised the Map. May I know how you are paying 30%-40% extra? Wikimapia.org shows extended versions of Bharitown Karachi towards north, which is abt 5 KM long then the actual approved plan and this extending aras is tagged 5 Marla plots and Awami apartmetns. Any Comments pls. My allotment in Pre-22.Not shown in map.I am disappointed.Malik Riaz Sb please look into it and alocate Pre-22 for the sake of allottees.Thanks in anticipation. sir plz pre 21-32 ka bata dain wo kha ha??????????????????????????????????????? All Precincts Map is now Updated! Is it Final? I have 500 Sq yard Plot which is in Precinct 29 which is very far Inside from Supper Highway. If I know about that location before I never purchase the land of Bahria town karachi. Allah SWT apna raham karay. Ab kia ab to phans gaye. Before they showed 500 sq yard plot in the center location of the map. yes you are right , this is against the actual master plan shown to us. I am an overseas Pakistani and booked a 1 kanal plot in March 2014 in Bahria Town Dubai office (cluster M, JLT) in Bahria Town Karachi. After the balloting my plot is appearing in precinct 4 and not in the overseas block. Is it right? When I checked from Bahria Dubai office, they said precinct I and 4 are both for overseas. Precinct 1 is for 250sqyd plots whereas the bigger plots are in precinct 4. Is it correct? Any update or anyone to verify? Can you please share sports city map? Ji shahid khan sahab, cool hojaiye. Ab Bahria ke pas mazeed zameen bhi he or new map bhi jisme sare precinct (includding 21-31) bhi shamil hen. Check yourself & relax brother. Now Pre-22 shown in map.But worried it appear too far from Super highway.What is distance.Can anyone of Bahria Authorities inform.Feel obliged if they do the needearly.Thanks in anticipation.On the other hand no progress heard in respect of Metro transport!Kindly respond. I didnt receive any letter about my allotment of plots. When did this happen and can anyone provide any guidelines on the 500sq yd prices and balloting result? I live in Dubai and want to sell my 500 sq yd plot in Bahria Town Karachi since I have two 500 plots and intend to keep only one due to affordability. Kindly contact me on my cell# 00971561579231 or email abdulrehman81@hotmail.com if you are interested. I have paid all the installments so far and only asking 9lacs on top of the total paid amount because I want to sell it urgently. Location of your Plot? Which precinct is it located? I think there may be some attraction/incentive for the allottees of pre 22 to28,as these appear much far away from the super highway.BTK to pleas consider it. Thanks. Are there any 500 Sq Yd plots in Precincts 1-16? Kindly Upload Precinct 08 Map please. precinct 27: neither plot size nor the plot number is readable. Compute section of city association need to check appropirate resoulti of map after uploading. In P-27, plot nos: are not visible, kindly deploy visible sight, even we can look them. YES IN SOME PRECINCTS’ MAPS, THE PLOT NUMBERS ARE NOT CLEARLY VISIBLE, EVEN ON CLOSE MAGNIFICATION. THEY REQUIRED TO BE RE-UPLOADED CLEARLY. In current one u can not read plot nos. Fraud in our Pakistani nature that’s why we suffer in all over the world, whatever we should do the fraud, people purchasing on behalf of current showing map and now they says the map under progress if your office in tower can you travel from PRECINCT-31 to tower??????????????????? My suggestion – Take an accommodation near Tower or MA Jinah Road, or take a job in North Karachi, Malir or in BTK. OR- Make a house in BTK-Pr-31, give it on rent and take rental house near your job place? Brother you will reach in half an hr. From P-31 to tower by Bahria Bullet Train. When I flaying so distance from PRECINCT-31 or beyond it I reached on airport with in a minute. Can anyone tell me Bahria Homes 200 Sqr Yrd Lies under Which which Precints not the Overseas one. If the map has changed once, it can change again. It is difficult to trust BT and Mr Malik Riaz, as the whole development may never be completed. The essential services as roads, water supply, gas and electricity may take many years or may never reach to many areas of BT. Many plots may end up as a barren land in the middle of nowhere. Biggest mosque, lectures and visits by religious people, dasterkhwan, and many other acts of charity are just smoke screen. If you are so disappointed then please withdraw your investment from Bahria. I am very much impressed with the development work. InshaAllah Grand Mosque will complete within time. I want to buy 500 Sq yard Plot in Precinct 4,9,16. If someone interested, please email me. Do we know profit on 500 square yard Plot in Precinct 4? I heard, it is the best Precinct, all Overseas were accommodated in it as well. Would like the know as well, if anyone interested in Selling their Plot in this Precinct. There are 2 well planned precincts for 500 sq.yds. i.e. 4 and 29. P-4 is near midway commercial where you have to pay in dollars if you buy overseas file. 29 is opposite to Golf residencia and on the main Jinnah avenue. Appreciate your input, do we know what is the profit in these 2 Precincts? Is there any Lakeview with 500 sq yard plots as some people who had chosen that option, seem to not get any such optioned plots in first ballot even though it was to be costing them 35% extra for Lakeview. Did Bahria took out Lakeview Block completely due to not enough applicant for it. Kindly give us some insight into it as well. In new map of Bahria town karachi you will find Precinct 30 to 39 after Precinct 29 on main Jinnah Avenue. For its plus points I wrote a review in Bahria town news channel that will help you to understand my point. Search in goggle: Bahria news channel… Click: on Bahria town Pakistan news channel Facebook …. Click: on review by Farid Uddin… Check the responses and click on precinct-29 …. Click on visitor posts and read. I also have a plot there and hope full with its future. Allah hamari investment ki hifazat karay Ameen. Thank you for your response . I will read your post . And amen to Allah hifazat karay as its hard earned halal money . Do u have any idea for Precinct 29C. Mine no is 53 250 Sq yards. Do u share plan if available. I have two plots in Prinscent 25 and 25A (125 squares yards) respectively. Could you please give me the developmental progress and current market value???? Moreover, what is the progress regarding Behria Town Karachi case at Supreme Court of Pakistan??? Dear A.Q. KHAN, I got 793, in precinct 29, please let me know which way it is facing , and how long it will take that area to be developed. Your plot No.793 in Pr.29, is (sized-50×90)= 500 sq yards (1 kanal) is south open, at right upper portion, 4th from corner plot No.796 clearly visible) at 40 feet wide road. The development is very fast, intensive & almost same in all parts, hopefully will be completed in short future. Your plot is located at centre right of P-29 in a row between plot 1467 to 1475 on street #16. It is an East open plot. InshaAllah we will meet there as I have # 1418.
it is really very big disappointment for me i was waiting for my plot number today i visited bahria office and when i ask them for balloting they give me my plt number as balloting was held in september,and it was in prct-30 at the end boundry of bahria as i know im regular installment payer and i have payed all installments up to now before time. balloting was done for all those who paid the installments … and balloting means it is a lucky draw … ppl can get plots at the end or at the beginning or in the middle or near waste disposal area, etc. So that is all on merit. im unable to see my plot in p-30 as plot number is 380,map is very bad quality plese upload better one atleast we can see the plot number. You can down load high resolution map from Bahria web site. Your plot is located in 2nd vertical row from Jinnah Avenue down the circle. It is a west open 250 sq.yds. opposite Golf Course and Golf View Apartment. God knows what is better for us. I got two regestration for 250 yards, reg. BTKP-MBR 4643 AND KKU 1435. Call Bahria office on toll free number 0800 00100 give them your CNIC and Regd. Number with applicant’s name. Only BTK can give you the exact information about balloting result. If you have been paid all six installments, your required updates can be available at their office, either call 0800 00100 or go to head office. You will find it. Do you know when will Precinct 30 be ready and handed over to the residents? Also the updates of Bahria Town KHI shows generic pics, are there any pics to show individual precinct progress? I physically observed the site development work is so fast inshaAllah all precincts will develop in time i.e. before 16th installments. 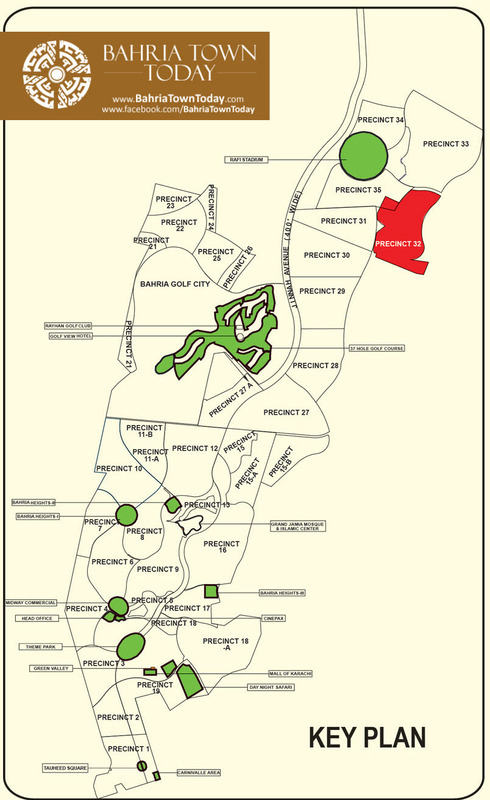 Precinct 5 is reserved for Mid way commercial 13 for Grand mosque and 20 for Golf. Villas are in Precinct 2, 10, 11, 17 and 27 as per map. I’m overseas pakistani and i have 125sq yards overseas home in btk. I cant understand how bahria has shown first different map showing location for overseas block and now they have mixed overseas homes in precint 11-b with homes 125 sq. yards . I made my investment after looking the overseas block location on map. How bahria can mix with normal homes with high valued overseas homes. Keep in mind not only overseas homes price is higher than normal homes but also we are paying installments in US dollars. BTK must realise overseas pakistani has made trust on them. I request to btk to review map for overseas block and give us same premium location as shown at begining of project. Nawed Akhtar u.k. Initial map was imaginary just showing the facility they offer like golf area, 5 star hotel and university etc. After proper measurements and planning they have re-alocate certain areas. They select level and less soil filling area for villas construction. But they gave good location villas to overseas applicants. This is my opinion. sir, i want to know that what is difference between Bahria homes (Quaid block) and Bahria homes (IHO) and where is location of bahria homes IHO. Can we check our payment schedule, dues online so we can avoid delay. please advise. I personally recently visit all bahria town karachi from Main entrance super highway to last Precinct 31, i think last precinct not more than 15 KM from main gate. Development work going on in Precinct 30 (Jinnah Avenue completed and inside road network under process) and Precinct 31 (Villa under construction). Which precinct in bahria town already have been balloted?. Which precinct is going to have ballot next and when, Any idea? I want to sell my 500 yards plot in precinct 4 (overseas plot). I have paid 8 installments. Plz send me email on engineer74@gmail.com with your offer. Please email me your plot number and demand. what is your plot number? I am an overseas Pakistani and booked a 1 kanal plot in March 2014 in Bahria Town Khi via its Dubai office (cluster M, JLT). After the balloting my plot is appearing in precinct 4 and not in the overseas block. When I checked from Bahria Dubai office, they said precinct 1 and 4 are both for overseas. Precinct 1 is for 250sqyd plots whereas the bigger plots are in precinct 4. Is it correct? Any update or anyone to verify? Bahria Town is a lottery scheme to make money, they use your money to invest in stock markets around the world and from interest and profits do the dev work. Wait for 10 years if you have life short then please trust me this is not for you. Allah will save from all of those Mafiaas soon he will be exposed openly. my plot is in precinct 25 how far is it from main gate.I have been there, twice last 15 days ago but was not able to reach precinct 25. is any development work been done there. The main map showing all precinct show baharia town is a rectangular shape showing precinct 25 on top but while going on car we are just going round and round. Is this map mado in actual basis. Aoa where is the percinent 33?its nit shown on map? Where is the precinct 33map?its not updated? I wants to know the location of hospitals in bahria town. How many hospitals & in which precinct? I wants to know the location of hospitals in bahria town karachi. How many hospitals & in which precinct? Sir please send me map of precinct-33 bhariya town karachi. Hy plz send map of percinent 33? Dear members for regular updates of Bahria Town kindly contact on whatsapp 0320-8299002. Can anybody please send me the map of Precinct 25-A? Where is excactly precint 33 located? where can i get new map of BTK? I own Behria Town Karachi 125yard residential plot’s file, and all 10 installments are timely paid but yet I could not get plot allotment number, I have checked August 2016 balloting results, can anyone advice what needs to be done? If you have paid all installments in time means before last date and you have none in surcharge column then you can claim for # allotment. If not so, then pay remaining installments in time they are bound to give you plot # before last installment. In 2nd balloting few fellows got numbers in old precincts like 15A and 30. InshaAllah you will get plot in good precinct. Hope for best. New precincts may come nearer to Super High Way. Is there any Precinct 40 ? One of my friend’s plot is balloted in Precinct 40. Where I can find map? Could you elaborate where the Precincts for Sports City project actually exist. I understand that precincts 34 to 45 are for Bahria Sports City and that map for each precinct is also provided; however I’m interested to know where is the location of overall Bahria Sports city project, e.g. is there a bigger map showing both Sports City location and other precincts of BTK? i also have a 125 sq yards plot in Precinct 25 could you send me a little updates regarding the development of Precinct 25 and how soon we can get the Allotment before we can start construction??? Please share the updates and map of Precinct 32. Got residential plot allotted in P-32. why is still the map not released yet? latest maps are there till P-31 and only not available are P-32 & P-33 post which the sports city starts ie from P-34 onwards. Still no maps for precincts 32 and 33, WHY? This is too much.. Zulm ki inteha.. They are the biggest cheaters on this era. Maps should have been released before the balloting not after. Where is the precienrt Map of 25-A, 26-A, 32,33 ??????? Reply with Num and Demand. That’s good that they have finally issued the map. However, the question is where does the Precinct 26-A itself located? P-45, Road 16 plot size 250 square yes available for sale. All installments paid . Interested may contact through SMS or WhatsApp at 03333523446. It is available with us. please can you update us about 15A official map? IHO stands for Opal Hoshang. Certificate that gives 500000 discount. Thanks for getting in touch and showing interest. To Book your Office/Shops in Jakvani Midway Tower or any other query regarding Bahria Town Karachi Plots feel free to contact at 03208299002. Salams: I like to know the exact location of your new project for shops and offices on the Map, including the street. ok that’s great sir kindly give me your contact number or contact with me on below details. I would like to confirm, when would b available expected map of precinct 29 C, and what do u think its location and current market price. when ballot will be done. make money on your blog. I know one cool method of earning money, I think you will like it. I have a 125 yds plot in Bahria Town Karachi in Precint 29-A. But i could’ nt find this precint in the Map. Can u please let me know the details, bcz i want to sell my plot asap. I have a one Unit in Bahria Homes Precinct 10, I have paid all the instalments religiously, But Last payment number 16 is due since February 2018, I have not been able to pay because of this litigation in courts is going on, do I can pay my last payment and remaining utility and possession charges to get hold of my unit ?. Kindly update the status of P 32 D. I heard from some1 that court order that the land of P 32 should be return to Malir. Is this true? I got plot there.